Johan Cruyff is the greatest player in Dutch history, but has he been more of an influence on the current players of Holland or Spain? This is a tremendously intriguing final for a variety of reasons. Firstly, because it is between the two non-World Cup-winning sides with the best historical record in the competition, using this table as the basis for that statement. One of them will finally break their duck. Furthermore, this is clash between two sides historically appreciated for their style of football. Before the tournament started, if we had asked a large sample of fans what their ideal final would be to guarantee an exciting game, Holland v Spain would surely have been the most popular answer, considering Brazil’s apparent negativity and the highly-structured Argentina side Diego Maradona looked set to field. But then, by their standards, neither Holland nor Spain have played particularly attractive football so far. Even accepting Honigstein’s theory that Holland are “no more defensive than 30 years ago”, it is interesting that, for a country so rooted in the concept of individualism, they have reached the final with few top-class performances from their star players. Wesley Sneijder is the one man who is being talked about in ‘Team of the Tournament’ terms, but his goal tally, his main achievement in the tournament, has been inflated by three rather fortunate goals. He and Robben have provided a couple of good moments, but nothing like the dominant performances they showed when guiding their sides to domestic doubles and the Champions League final last season. Holland have been successful in 2010 because they’ve worked well as a unit. With this debate about the nature of the Holland team, it’s perfect that they come up against a Spain side who arguably display more of a classically ‘Dutch’ attitude towards football. Jonathan Wilson has this week commented that Spain are ‘essentially using the Barcelona formula’ in terms of tactics, and there is a clear crossover with Barcelona in terms of personnel too. When David Villa scored the winner against Paraguay last week, there were 7 Barcelona-owned players on the pitch at the time: Carles Puyol, Gerard Pique, Sergio Busquets, Xavi Hernandez, Andres Iniesta, Pedro Rodriguez and Villa. Another, Cesc Fabregas, has been strongly linked with a move back to the Nou Camp this summer. But the more fascinating aspect is that seven of those eight (this time including Fabregas but excluding Villa) are players who were brought up as Barcelona players – all of them spent considerable time at La Masia, and the majority made their professional debut for the club. The Dutch influence on Barcelona cannot be overstated – in its entire history, only four managers have been in charge of the club for more than 150 matches, and all four have been from Holland – Rinus Michels (1971-75 and 1976-78), Johan Cruyff (1988-96), Louis van Gaal (1997-2000) and Frank Rijkaard (2003-08). Nine of their 20 La Liga titles have been won under Dutch management. Michels is possibly the most important factor to consider here. ‘He was the father of Total Football, and he carried it on at Barcelona’, as Wilson says in Inverting the Pyramid. From him, there is a clear Dutch link to the present day. Cruyff was a Barcelona player under Michels, then when he became manager, brought Rijkaard to the club. The present manager, Pep Guardiola, played under Cruyff, van Gaal, and then managed the Barcelona B team during Rijkaard’s final season, and Guardiola’s influence on Spain’s squad both as a player (Xavi, Iniesta) and as a manager (Pedro, Busquets) has been well-documented. It is not just a coincidental chain, either. Cruyff described Michels as his “first and only football master”. Guardiola pinpoints Cruyff as the key factor in his successful career, saying, “Cruyff believed I could do it, and gave me the opportunity. I think there are lots of people with talent who simetimes miss out simply because they are not given the chance. 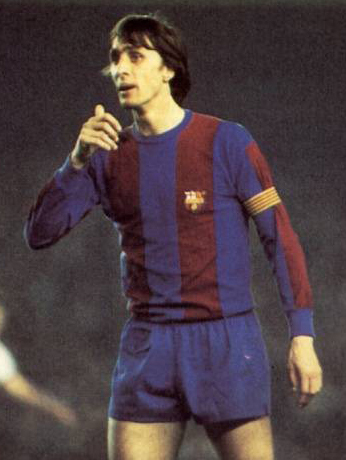 I owe it to Cruyff’. When Cruyff managed Barcelona, he “turned the Catalan giants into Europe’s leading club, and, arguably, the Continent’s standard-bearer for beautiful, attacking football” as David Winner puts it, a position they have regained under Guardiola. In Winner’s book about Dutch football, ‘Brilliant Orange’, his description of the main factors of Total Football (aside from the well-documented switching of positions) is telling, when considering the Dutch influence upon Barcelona. This could be a description of Barcelona – flexibility, making the pitch as wide as possible, heavy pressing, a high line and an aggressive offside trap. This is not a history lesson on Barcelona, but a recognition that Puyol, Pique, Busquets, Xavi, Iniesta and Pedro (60% of Spain’s likely outfield XI for the final) all grew up in surroundings inherently shaped by Dutch figures and Dutch theories, dating back to Total Football. But then, there is a further twist, because the current Spain side are playing football which has disappointed some in terms of excitement and attacking flair. Few expected a Holland v Spain World Cup final where the major discussion about both sides was ‘Are they boring?’, a debate touched upon by Giancarlo Rinaldi, looking at Vicente del Bosque’s players. Spain certainly haven’t created as many goalscoring opportunities as expected, but even though their three knockout games have finished 1-0, against Portugal, Paraguay and then Germany, all have been good games, despite (or maybe because of) the lack of goals. “We probably don’t appreciate just how hard it is to open teams that, scared of Spain’s talent, sit deep, close off space and give their opponents no time to breathe”, says says Sid Lowe, in a piece with some fascinating quotes from Xavi. But they have largely stuck to the Dutch/Barcelona formula in terms of ball retention, heavy pressing and a high defensive line. The one exception has been Spain’s clear lack of width. The final is a simple clash between two great football nations and two historical underachievers, but is also perfect in terms of footballing ideology. The history of Dutch football is a history of underachievement and disappointment. Failure once again on Sunday night would be a failure extraordinary even for the Dutch, because they would be beaten to their first World Cup by a side who have borrowed so much from their way of playing football. Great introduction to the side’s histories and philosophies – Can’t wait for the full preview. Are you publishing a tactical preview of the 3rd place play-off? No, not a preview for that game. Tactics don’t matter in this game, its all about which team is more hungrier and wants to be there. I wouldn’t say that tactics don’t matter at all, but motivation is certainly a bigger factor. Yeah, that is part of the thinking. Will review it if it’s an interesting game, if it’s not then it’s probably best ignored. Good choice. Who cares for that game other then Fifa and TV Stations. i don’t think hunger is a factor because all the teams that came to the world cup has the hunger to win it although very few really belieave in it but i think it will be the quality and the temprament that will matter more in this game.30 teams that have left so far one lacked the temprament( i mean Brazil ) and the others lacked quality. if only about quality then spain will win this hands down no problem but funny things can happen in this world. and one very imprtant thing will be lady luck who ever has it well he should not worry about any thing. Nice introduction before the big game. But I don’t agree the connection between Total Football and 2010WC Spain. I think the Dutch connection certainly stands up. The current Spanish side is dominated by the current Barcelona side in terms of tactics and players; a Barcelona team that has undeniable Dutch influences – whether first hand, through Rijkaard or second-hand through Guardiola. Some really good points you mentioned there to backup your statement, mate! I think it’s just the connection that both styles have with Barcelona. It’s certainly not Total Football like 30 years ago, but Barcelona’s the closest thing we’ve got outside of Netherlands. It’s fascinating how del Bosque plays like Barcelona when he is through and through a Blanco. But he is not playing like barca, he is playing a ”dual-pivot” system with a fair amount of flexibility, but with a strong lack of the wingplay that is nigh on essential/unmissable in barca brand 4-3-3 dutch influenced football. I think this spain team is even more fond of keeping posession than 2009 vintage barca, and the pace is deliberately slower too. Hmm , conparisons are there. But to say that its entirely barca based is perhaps unfair. The way I see it, Spanish Tiki-Taka plays has a deep connection with the dutch Total Football, but with a diferent focus. Both try to impose their pace on the game, but while Total Football did this by controling “Space”, Tiki-taka aims to control “Possession”. But from what i gather, Total Football was one of a number of stategic systems that aimed to control an aspect of the game. And while Barca have taken the 4-3-3 shape of Total Football as well as its attacking ethos, I strongly believe that this currect Spanish national team has more in common with classical argentinian play (the focus on controlling posession) than it has with the dutch school. I acknowledge that a large propertion of the team are of a ;;total football;; derived education, but on the pitch, their play and their patterns are of a more latin school. I agree with your analysis on the primacy of Argentinian football in Spain’s heritage. Yeah, you can’t completely duplicate a system from 30 years ago. I didn’t know about the Argies’ system. Great stuff, mates. when spain are not in possession, i think the comparison holds up extremely well. spain deny the opposition space superbly, pushing up and making the pitch very small. but it falls down when spain have got the ball. attacking width and inter-changing of positions were such integral components of the way those dutch sides played, and spain don’t build attacks that way at all. generally speaking, i’d say that the way the dutch attacked in the 70’s was far more joyous and expressive, whereas this spain side is much more functional and efficient – albeit aesthetically pleasing at the same time. overall, i’d say spain grind teams down, turning football into a beautiful war of attrition, whereas 1970’s holland simply blew opposition teams away (which is also a war reference, but i hope you get what i’m trying to say). anyway, in terms of attacking, the comparison is rather pointless as all teams are so much fitter and better organised nowadays. It’s curious that Cruyff’s Barcelona of the early 90s played a more relaxed style of Ajax-football, whereas Van Gaal’s team of the late 90s was essentially an intensified version of this; similar formation, similar structure but with a brief to up the tempo and run harder. Neither Cruyff’s nor Van Gaal’s Barca displayed much interchanging of positions as per classical Total Voetbol. Premier League and Serie A especially. Well, it’s a lot easier to avoid going crazy and taking a flyer on a south american, when your youth-academy keeps spitting out premier talent. Besides, if I was the manager of a team with Barcas dominance in the league, I would give local (and therefore popular) players a shot all the time. I mean, Pep can be 95% positive that Barca will crush Real-what’s-teir-name regardless of starting XI and bench width, so bringing in young locals is a nobrainer. The Barca organisation needs to be given the credit – Pep’s just doing what we all would in his situation. This really has been the world cup of 4-2-3-1. I expect it to fully influence the tactics of many more coaches, that will realise that 4-4-2 is rarely successful in knockout competitions these days. Some English sides still tend to stick to this, and for some weird reason Capello also did. Considering he hasn’t won a cup in over 15 years, maybe this shouldn’t come as a surprise after all though. Maybe more teams will go over to 4-2-3-1 or 4-3-3. Need a senna like DM as well, just shows how demanding 4-4-2 is on personnel. What do you mean “cup”? Knockout tournaments? Because he won the championship with Real in 2007 and with Juve in 04-06 (later stripped – dunno if he should be given credit). but I prefer a 3-2 or 4-1 ordinary match than a 1-0 extraordinary match. I love to see a true champion! not a hit and run. I’m a bit surprised that this theory is agreed upon by everybody: Spain is playing the dutch way, and the Netherlands are boring but efficient. The Netherlands have been the most exciting team in a while to watch at the euro 2008 – until they lost to an even more brilliant team, during one game, Russia. What is maybe more relevant, is that I have watched a lot of the dutch qualifying games and they showed beautiful football. The following friendly games were an avalanche of goals and the fluidity of the game was really a joy to see. This is my memories of those games, so my goals “statistics” are not bulletproof. Anyway, i was very excited before the tournament with this team. During this tournament, the dutch games were boring, compared to the ones leading up to it. It just annoys me a little that everybody seems to agree that the dutch are boring, or that they haven’t played exciting football since 78. I hope Oranje wins with their heart, they deserve it. They’ve played enough beautiful football the last 2 years. I have a question: there’s a theory that this final can be an Inter-Barcelona repeat (Wesley Sneijder alluded to it in the dutch press). I like the idea, but i’m a bit worried that without a Milito or Eto’o (a killer) it might not work. Plus the oranje defense is a bit scarier than Inter’s defense. Any thoughts? Nice article as always ZM. Have you read Team Building – The Road to Success by Michels? Cracking book although its a bit technical in places. 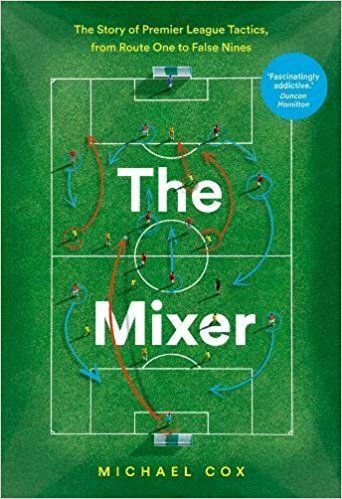 I am sure in modern football some of the drills/methods are a little outdated but I certainly found it to be enlightening on a tactical level, perhaps you could add it to your bibliographies section? Just had a quick look at that Honigstein article, he doesn’t mention Michels once. Lazy stuff Rapha tut tut! He says Van Bastens Euro winners and Cryuff’s Ajax when mentioning Total Football. I think Mister Marble as they called him at Barca would have something to say about the players getting ALL the credit! Let’s be honest. We are just hoping that they come out to win and not “feel each other out” for ninety minutes. The other huge foreign influence in Spanish football historically has been Argentine in origin; coaches and players from that country. And you can see the more patient passing approach of Spain owing to this. Spain usually (though not necessarily always, as evidenced by Luis Aragones’ injection of verticality with a fit Fernando Torres and a super-sub in Fabregas at Euro 2008) have tended to masticate the ball more and forego intensity, which was a critical element in the old Dutch game. Arguably, Chile retain the tactical shape and urgency (modified through the prism of Van Gaal) of Ajax football. Everything has proceeded perfectly according to my devious plan. I had Netherlands-Spain picked as my final. In high quality tournaments like the World Cup, football lovers look forward to great displays of individual skill, brilliant goals, and fantastic “exciting” games. While great skill is certainly on display, the “big” match-ups tend to fail to live up to our high expectations for an obvious but overlooked reason: the defensive quality at the highest level is as good as the opposing offense. When we think back on games with great entertaining offensive displays, it’s usually because one team is beating up on the other. At the highest level in this day and age, two balanced teams with good tactics are going to keep the scoring opportunities low. For myself, I’m a fan of probing development rather than willy-nilly forward offenses, so I enjoy a match where scoring opportunities are hard-won. That said, I think this Final could be a pretty open game. I hope Holland steps up from their rather sloppy technical performance against Uruguay; otherwise Spain will dismantle them much the way they took apart Germany. If both teams are sharp, I expect to see each possess the ball well, with Holland being more willing to invent a scoring opportunity quickly and Spain more patiently waiting for an opening. If both teams bring their A-game and A-teams (i.e. Torres starts on the bench), it could go either way. Did they not also set the standard under Rijkaard? They did indeed, but Rijkaard is perhaps not romantic enough a figure to be noted. Airbrushed from history, and unfairly so in my opinion. ZM; Off topic: Are you an Arsenal fan? Saw some earlier comments that implied that but I’m not sure that was you, or another admin. Don’t think it affects your objectiveness whatsoever. I am an Arsenal fan too, but agree with your critisism of Wenger’s tactics and Vermaelens positioning. Anyway, would you say that Arsenal play a dutch style? Holland certainly don’t fit in with what you would associate with a Dutch team of the past, there isn’t much of the ”Total Football” about them, instead they are a disciplined, well organised side, but I still think Spain are favourites. I underestimated Spain before the German game, particularly underestimating the work they do off the ball, and I thought Spain would have trouble picking up the runs of Ozil, Khedera and Schweinsteiger from midfield, however this wasn’t the case as Spain completely dominated posession of the ball, and Alonso, and Busquets in particular helped to control the midfield on a defensive side. Although Spain are the favourites, Holland are by no means massive underdogs, and could certainly beat the Spainish. Alot of people would probably disagree, but I would drop Van Persie, who hasn’t had a great tournament, and play Kuyt as a lone striker. He has an intense non stop work rate, and he could cause Puyol and Pique problems with that, and he can also drop back and pick up Alonso, who likes to sit deep and dominate. Chasing Xavi around the pitch will be a waste, Holland can allow Xavi posession in his own half, but once he enters the Dutch half of the pitch, one of either Van Bommel or De Jong must close him down intensely and agressively, allowing him no time on the ball. It is also important Iniesta is showed down the right hand side when he has the ball, he musn’t be allowed to cut inside. Of course, Iniesta is a wonderfully technically gifted footballer, but using pace to attack the full back down the right hand side isn’t really what you associate with him, show him inside, and then he must be closed down intensively and agressively as well. I extremely doubt the Dutch will agree with me, and Kuyt will probably play on the left, a position where he offers both negative and positive points. He offers good protection, as he will always be willing to work back, but he isn’t blessed with great speed, which means tracking the forward runs of Ramos constantly will be a problem, and does he have the skill or pace to counter and exploit the gaps that Ramos will leave? Personally I would go for Ryan Babel on the left, he can offer defensive protection if he is coached and encouraged, and he has the pace and ability to exploit the gaps that Spain leave down the right hand side. What do others think? I am pretty certain – as you say – that it is not going to happen that way. Babel will not play, as he has been benched and struggled for Liverpool this season. Starting him would be a massive gamble, and one that isn’t likely to pay off. He doesn’t have the confidence at the moment. Van Persie has not had a very good tournament, but I thought he was overly critized for his latest performances. He did link up pretty well against Uruguay and played his teammates into some good chances. No, the Dutch line-up is pretty set. The biggest question for the positions is probably whether Kuyt/Robben will play on the left or right. Kuyt is probably best on the right, but could be used on the left to stop Ramos and (probably) Pedro. Playing Robben on the right, would probably ensure that Ramos doesn’t venture forward often. Kuyt on the left would be up against Iniesta, someone who is about his league pace-wise. However Pedro is significantly faster than van Bronckhorst on the left, and could cause him problems on his own. Kuyt on the left leaves the problems you said about his pace though. It’s a difficult one, but I would probably start with Kuyt on the left and play a deep defensive line. I agree with this as well. Do not expect any changes in personnel, and the biggest decision will be about which flank to start Kuyt or Robben on. In the end, I think Van Marwijk will stick with Robben on the right, mostly because Robben feels most comfortable there. I also think Gio is going to be the player who will require the most backup in the form of Kuyt, and those 2 have been linking up very well these last few games. My biggest concern from the Dutch pov is what to do about Iniesta. Will he be tracked back by vd Wiel the same way Gio would follow Alves all over the pitch against Brasil? Robben will not provide the defensive cover that Kuyt did in that game to make up for that. 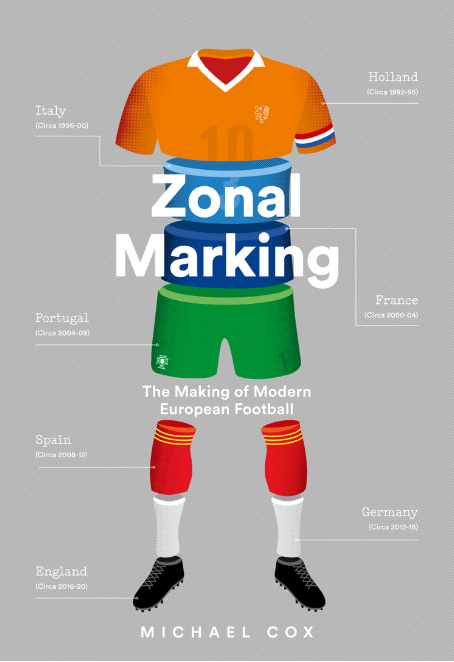 Please is there a chance that over the summer, sometime after the final but before the new season, that you’d do an article with diagrams devoted to Dutch, 1970’s Total Football? Thanks for all your great work over the World Cup, it’s been a great read. Isn’t it strange that these two haven’t played each other for over eight years? You would have thought they would be a good match for each other in friendlies even when they weren’t meeting each other competitively. It’s over 27 years since Spain beat Holland in a full international (three Dutch wins and a draw in the meantime). And this piece outlines how the Dutch taught the Spanish everything they know – is there a psychological edge there? ZM, When you said that part about the aggressiveness of the offside trap, I immediately remembered Barcelona in 2008/09. Which reminded me about that particular time period in which I merely said “I don’t know how it’s done!”. But now, as I have discovered this awesome site I thought that maybe after the world cup you could possibly make an article about them in that incredible season. There is also some other theories that Austrian Wunderteam (1931 – 1940) was the original creator of TOTAL FOOTBALL.We should take note that Ernst Happel, the famous Austrian player who played in 1950’s became the coach in Netherlands in 60’s and 70’s and also coached the national team in WC finals of 1978. Nice analysis, but everybody seems to be looking at the dutch as the “inventors” of a certain type of game, when they were essentially the team that benefited the most and best publicized the system. Reading Wilson’s “Inverting the Pyramid” one gets the perspective of how pressing and passing had already been around much earlier. The main difference was the consequences of a team filled with some of the best players of all times. One note about Cruyff’s Barcelona: the affirmation that he «turned the Catalan giants into Europe’s leading club» is somewhat strange. In eight years (1988-1996) in front of the team, he managed one Champions League trophy. In the same time, AC Milan got three. He made them exciting and the biggest club in Spain, but not in Europe. The Dutch have always been great at spatial planning. Every square metre in the whole of the country is excessively planned and organised. The wingers now only start from the halfway line, but they still are (modern day) wingers. Elements of the total football era still survive, see Van Bronckhorst at Euro 2008 against Italy. At Barça it isn’t the Spanish who’ve played outside left and right. The Spanish team now in my view, is more playing 4-2-1-2-1. As many lines as possible. You can’t squeeze them, and with a good base it’s difficult to turn them over. But the lack of width may cause them some problems, and Van Bronckhorst is smart enough to see the possibilities to exploit them. In his final match, he can as well go all out. Help may come, or so I hope, from Van der Vaart joining the team in the second half, in stead of De Jong who may be troubled too much by Iniesta or Pedro. Then Van Persie can finally show himself, he likes to play with VdV. I prefer Van Bronckhorst, Van der Vaart and Van Persie, as the players ‘less influenced’ by the pragmatic, realistic, almost cynical approach of this Dutch team. They would be my favourite World Cup winners. Been busy with a new job and baby but my fever/flu has slowed me down enough to catch up on these articles. This one is fantastic and the more I study tactics and styles the more of a neutral I have become. I hope tonight gives us the opportunity to see something amazing either from a Xavi masterclass or the Dutch continuing on their run of fortune to force Spain into chasing the game. Zidane’s Quest is over. 32 teams arrived in South Africa. Countless eternal moments were born. In the end, only one team was left standing – Spain, 2010 World Cup champions.